Have you ever wondered why we hate our anger so much? Or why it is that we can be so afraid of being angry? Anger is one of our basic emotions but anger can be a tricky emotion for many reasons. First of all, most of us were socialized that being angry was very un-ladylike. It was not readily accepted or encouraged and even frowned upon in the societies and the families that we grew up in. How many people do you know that have a healthy expression of anger? Probably not too many right? Why is that? Usually anger is expressed in dysfunctional unhelpful ways. Most of the time anger is suppressed, or displayed as passive-aggressive, or a blow-up/ reactive/ fly off the handle kind of expression. What happens when you disavow your anger? Do you know someone who is overly nice but on second look not so much? I often hear of these stories from our tribe. Somehow you're picking up that deep down they're driven by something that's not as “nice” as their outward behavior would indicate, and actually it's anger. During a recent mini session, I asked Susan, "what's not perfect in your life right now?" I ask this commonly to understand what's most troubling to you and then work the magic that is coaching for the next 30-minutes so you leave with some concrete tools you can use immediately! So on our call Susan told me about how she wanted to learn to respond instead of react when triggered by certain relationships in her life. 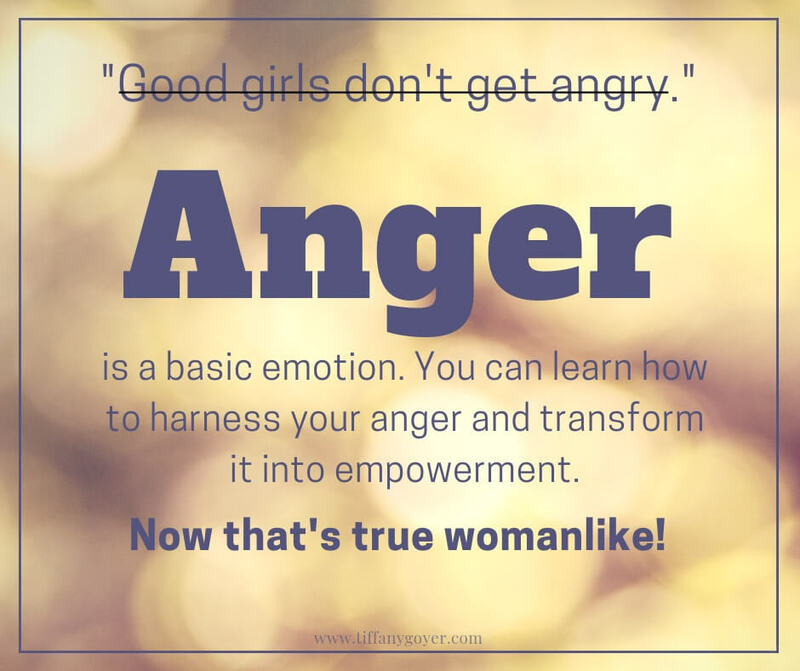 In other words, she wanted to learn how to express anger healthily. Susan, an entrepreneur, told me about how she'd been busy traveling to New York just before the recent holidays and decided to skip her family's traditional Thanksgiving's dinner at her sister-in-law's in lieu of a weekend visiting Kurt, the new guy she was dating and instead host a down-to-earth-chic dinner party back home at her place for a Friendsgiving including her brother, sister-in-law and mother. It sounded like fun. She explained that her sister-in-law made a lovely gesture by bringing a beautiful dessert (unasked for) and then proceeded to make a big deal about it all night with backhanded comments aimed at Susan's lifestyle choices. Later in the night after one too many glasses of wine her sister-in-law made it clear in so many words that she was actually angry (although she didn’t admit to the anger). She told Susan that she was “selfish” because she didn't “care about” or “respect her own family enough” to be a part of Thanksgiving that the sister-in-law hosted. Susan was dumbfounded and embarrassed. Susan told me that she’d been working on her people-pleasing behaviors, and this was the kinda episode that would send her spinning back into her desire to please but at the same time feeling mind-numbingly resentful, boarding on rage. Does this sound familiar? It’s a perfect example of passive-aggressive behavior. I’m sure you know people in your life that act out anger like this, and maybe you even do it yourself. And that’s why getting OK with your anger is important. It also helps us understand better how to deal with other people’s anger. It’s hard to stop people pleasing when others aren’t so pleased with your choices. It’s also hard to people please and lose your TRUE self in the vain process of trying to make everyone in your life happy except yourself. Half the time it’ll work and half the time it won’t, and abdicating your own needs in the hope of being “in control” of someone else’s happiness when it isn’t even possible is tragic. Remember people’s feelings (of happiness or otherwise) come from their own thoughts. Thoughts cause feeling. You do not cause other people’s feeling and other people do not cause yours, unless you allow them to, with certain triggers. And those triggers can be unlearned. Anger can be your friend. When we deny our anger we don't even understand it because we haven't unpacked it. I bet you know stories of passive-aggressive behavior like that of Susan’s sister-in-law pretty well. So why's that bad? Well, it doesn't get us the results we want. Susan’s own anger towards her sister-in-law’s behavior resulted in little respect for her sister-in-law, even though when I asked, she told me that she actually desires to have a close bond with her. And her sister in law’s passive-aggressive behavior certainly didn’t win her Susan’s respect. It’s hard to think/feel that you’ve successfully won over the respect of another person when you put them down anyway, right? It doesn’t make any sense, but this is the kinda thing that happens when anger is looked at as a negative thing. No one learned from their anger that night. But anger is just information that can inform us, it can signal us to be aware of what's going on inside of us, because something is. Then we can pause, take a look, and understand it and decide what to do with it. Like taking better care of ourselves. Maybe that means voicing something that you determine needs to be said, and maybe it means that you deal with it on your end without even involving another person. The point is, you get to consciously decide to allow your anger to be ok with you and express it in more purposeful useful ways. This is true empowerment. Using your anger as a tool to inform you of how to take better care of yourself, your relationships and your life with love and respect. Next week I’m gonna talk a little more about anger, and tell you about how it showed up in Susan’s new romantic relationship with Kurt. The first step is always awareness. What does anger feel like in your body? How do you normally experience it? 1. Recall how your family felt about anger. How was anger expressed in the home you grew up in? 2. What kind of anger was it? Perhaps, overt anger: yelling, slamming doors, verbal abuse, physical violence? Maybe it was covert anger: passive-aggressive communication and behavior, silent treatment, stonewalling, unspoken agreements NOT to discuss conflict directly or to be withdrawn when angry? 3. What about your culture? What was the larger picture culture like in reference to anger? For example, some cultures are super direct and less anger avoidant than others. 4. Describe your relationship to your own anger? How’s that relationship in your life? Would you like a better relationship with your anger? The tools and strategies I’ll share with you will actually help you tap into your “real” anger so that it becomes the harness to your real power. Your real empowerment. Having agency over yourself— being able to speak what’s really on your mind, telling the truth, drawing boundaries gracefully and with ease, asking for what you prefer, and saying no when you need to. It’s some of the best stuff life’s made of.